Jason Dufner has a five-shot advantage after his second straight 65. 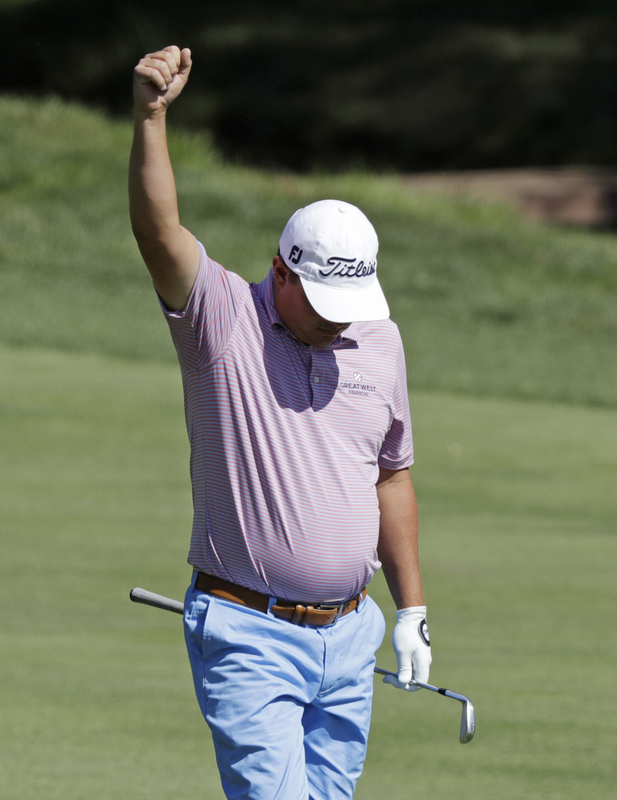 DUBLIN, Ohio — Jason Dufner wanted to put together more than just a few good rounds this week at the Memorial. The first two put him in the record book. Dufner holed out from 176 yards on the 18th hole for an eagle, and then added three more birdies on the front nine at Muirfield Village for another 7-under 65, giving him the 36-hole scoring record at the Memorial and a five-shot lead going into the weekend. He was at 14-under 130, one shot better than the record previously held by Rickie Fowler (2010) and Scott Hoch (1987). Neither wound up winning the tournament. Daniel Summerhays bogeyed his last hole and shot 69, leaving him five shots behind Dufner. Fowler (66) was another shot behind. Jordan Spieth was one shot out of the lead after the opening round but was already eight shots back when he teed off, and all he managed was a 72. Spieth and Justin Thomas (71) were tied for fourth, eight shots behind. Dustin Johnson, the world’s No. 1 player, won’t be chasing Dufner. Coming off a 78 – his first round without a birdie in nearly four years – Johnson couldn’t get anything going and shot 74 to miss the cut by five shots. ROBERTO DE VICENZO, known has much for his scorecard error at the 1968 Masters as his 1967 British Open victory that made him Argentina’s first major golf champion, died Thursday afternoon at his home in Buenos Aires. De Vicenzo amassed 230 titles worldwide, mostly in South America, but he achieved fame on the biggest stages in golf. He outlasted Jack Nicklaus to win the 1967 British Open by two shots. After a birdie on the 17th hole to take a one-shot lead, he made bogey on the final hole for a 7-under 65, presumably setting up a playoff the next day against Bob Goalby. But his playing partner, Tommy Aaron, marked a par 4 for the 17th hole on De Vicenzo’s scorecard, and De Vicenzo signed it. Under the Rules of Golf, that turned his 65 into a 66 and made Goalby the winner. LPGA: Anna Nordqvist, the two-time defending champion at the ShopRite LPGA Classic, shot a 7-under 64 to take a one-stroke lead after the first round in Galloway Township, New Jersey. Moriya Jutanugarn, Jeong Eun Lee, Jenny Shin and Jennifer Song were tied for second, and Paula Creamer, Pornanong Phatlum and In-Kyung Kim followed at 66. EUROPEAN TOUR: Jamie Donaldson of Wales shot his second straight 4-under 69 to open a two-stroke lead midway through the Nordea Masters in Malmo, Sweden. Italy’s Renato Paratore was in second place after a 72. Graeme Storm (68) and Max Orrin (73) of England and Benjamin Hebert (71) of France were three shots back.